As loving caregivers to our canine companions, we desire to do whatever we can to ensure that they live happy, healthy, and comfortable lives. This includes regular vet visits, lots of exercise, high quality nutrition, lots of love, and proper grooming and bathing. One area of healthcare that often gets overlooked by even the most conscientious pet owners is oral hygiene. Signs of oral problems in your dog include bad breath, bleeding gums, yellow or brown tartar build up, difficulty eating, or pawing at the mouth. A healthy mouth can vastly improve your dog's overall health. If you watch dog food commercials or read the advertisements, you will see smiling people and shiny, happy, and healthy looking dogs. It can be overwhelming and intimidating to try to choose the healthiest choice for our dog. The first thing to check for is that the feed you are considering has been approved by the Pet Food Industry Association of Australia (PFIAA). In order to be marked as "complete and balanced" the food must be tested to ensure that it does not contain any nutritional deficiencies. Also, look for a seal from the Veterinary Oral Health Council (VOHC). In order to attain this seal, the foods must also meet all the other nutritional requirements as well as have additional dental benefits. Do your research, and seek out healthy dog food and treat to ensure better health for your dog. Also, talk to your veterinarian to get recommendations for your particular dog. 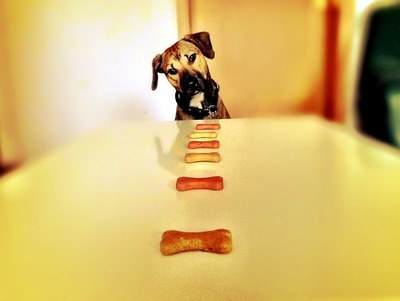 As vast as the world of dog food is, dog treats, toys, and chew toys are even more numerous. A good, strong chew toy or rawhide can greatly aid your dog's oral health. The chewing helps naturally remove softer plaque before it hardens into difficult to remove tartar. A buildup of tartar in a dog's mouth leads to buildup of bacteria, and can cause gum disease, bad breath, tooth loss, and numerous other problems. 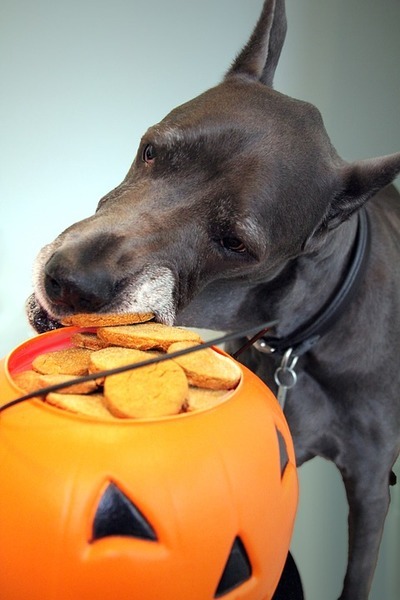 Dog treats are fun for owners and dogs alike, but choose carefully. The same thought that goes into choosing dog food should also go into choosing the dog treats. If you want to try something different, consider making your own healthy homemade dog treats you can feel good about giving your pet. Many pet owners like to sneak their dog a treat under the table from time to time. While the occasional tidbit of hamburger or chicken is perfectly acceptable, do so in moderation. It is also important to avoid many human foods completely, such as yeast dough, dairy, grapes, and alcohol to name a few. These foods can affect digestion, organ function, overall health, and dental health. Sticky foods can get stuck in our pet's teeth, just like in our own too, causing the same types of problems, allowing the build of bacteria and leading to decay. Just like oral health care is multifaceted with humans, the same is true of our dog counterparts. A combination of regular brushing, chew toys, healthy diet, and knowledge of what dog teeth problems to watch for are all important factors in ensuring a healthy mouth for your dog.